Every decade has its Michael Myers and each generation has its own entry point to the Halloween movie franchise, as Chris Durand became one of the most popular performers to ever embody The Shape when he put on the iconic mask for Halloween H20: Twenty Years Later, but at the time, he had no idea what he was stepping into. The seventh entry the franchise was the second (after Season of the Witch) to adopt the choose-your-own-adventure idea of completely retconning the existing canon, disregarding the third through sixth films, instead picking up the action 20 years after the first Halloween and acknowledging only the events of John Carpenter’s 1978 original and its 1981 sequel Halloween II. It was a bold move, made all the more irresistible with the added attraction of Jame Lee Curtis returning to reprise her role as Laurie Strode, no longer dead after a fatal car accident as stated in Halloween 4, but having faked her death and assumed a new identity to hide from her psycho killer brother. Of course Myers finds her again, for what was to be the final showdown between Michael and Laurie (at least we thought at the time, but how wrong we were). While it may have alienated some fans of the Thorn Trilogy, H20 was a massive box office hit and has remained one of the most popular Halloween movies among fans of the franchise. 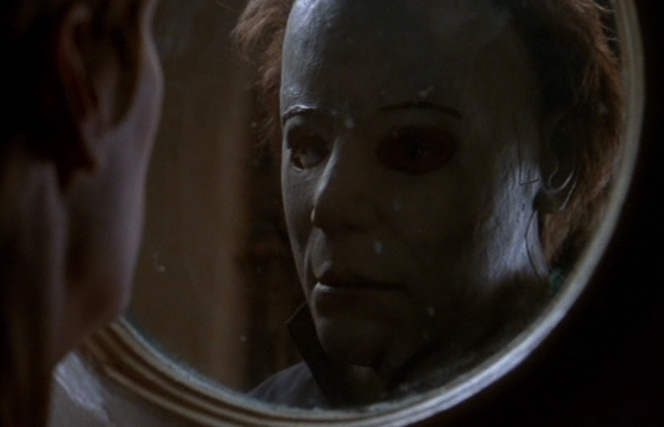 When it was announced that Curtis would again play Strode in Halloween 2018, many of those fans threw together an online petition to get Durand back behind the mask, and he was among those considered to play Myers in the most recent film (as we learned in our interview with Sean Clark here), before producers settled on James Jude Courtney (read our interview here) and Nick Castle (read our interview here). Chris Durand was already a seasoned stunt actor by 1998 when he was cast in H20, having previously worked on The Crow, The Mask, The Lost World: Jurassic Park, and Armageddon, and gained slasher acclaim when he played the Ghostface killer in Wes Craven’s 1997 sequel Scream 2, which is ironically the same movie that characters in H20 are watching in one scene. More recently, Chris has appeared on screen in arguably Marvel’s best movie, Captain America: The Winter Soldier, and HBO’s Westworld. I talked to Chris Durand at this past October’s historic H40: Forty Years of Terror Halloween anniversary event in Pasadena, CA., where he was among a total of 19 actors and stuntmen who played Myers throughout all 11 films of the franchise that were in attendance along with over 50 other cast and crew, the largest gathering of its kind in history. Read on for our interview with Chris Durand on being a part of the Halloween legacy, the many masks of The Shape, and bringing Michael Myers back to life for the H20 generation. Chris Durand is Michael Myers in ‘Halloween H20: Twenty Years Later’. Here we are, it’s the 40th anniversary of the original Halloween and the 20th anniversary of Halloween H20, when you stepped into that iconic role and helped introduce the character to a whole new generation. What was that like for you? What’s interesting to me about the whole thing is that I really did not know what a big deal it was when I stepped into the role. I’ve told the story many times. I didn’t watch any of the others on purpose. And that was largely a misunderstanding from what I heard in the interview. I think they said, ‘We’re not going to do what came before’. So I socked that away. And what they meant was they weren’t going to reference the shows (movies) in between (ignoring Halloween 3-6). My misunderstanding was a good happy accident, because when I got it, I didn’t stress about it. I said, ‘We’re not doing that. Why worry about it? When we get to set I’ll figure it out.’ So I show up and I’m doing this thing, and you know it’s a big deal, but not really. It’s when I have the (real life) sheriff on a location coming up and asking for my autograph, and a doctor stopping by because they’re on their way home and they see what’s going on they want your autograph. And you’re like, ‘This is crazy.’ I didn’t realize it. Now, what I really get is that everybody who was a kid then but was old enough to see it comes up to me or contacts me on Facebook or something, and they say, ‘You introduced me to the series. And thank you,’ which is really cool, because I was going to do a job and it’s now made an impact, not just with that movie but with a much broader audience and a much broader community. So that’s kind of neat that it all ties together. And that’s one of the reasons that I come out and do the cons. I don’t need to revisit the show, but it’s neat to let everyone know the stories and the inside track of what they want to know. So I try to come out and talk to people more than anything, and that’s what makes it fun. I’ll tell you a story that happened way back at the beginning. When I’d just done the show, I would go out and do some haunted houses and some events. I went to Tennessee and the setup there was that they’d bring you out, this was kind of a flat fee thing, and they’d set you up on the line going into the house. And you would just sign for like two hours. Everybody coming by gets a free picture going into the house. It was a promotional thing. It was soon after the movie came out. I think it was the next year. I said, ‘Is he still here?’ And we sprinted to the parking lot, and we caught him. They were just loading him into the van. I spent 45 minutes just hanging out talking with the kid. I made sure we brought the extra stuff that we had and signed a bunch of stuff for him. You could see the dad’s just in tears. That one thing right there made my trip. The rest of it was fun and great, but that’s what made the trip. That’s what’s fun. I’ve had people at shows come up and just say, ‘I don’t have any money,’ and you can tell they’re almost in tears because they’re big fans. And I’m like, ‘Don’t worry about it.’ It’s a photo. Take one. Here, I’ll sign it for you. Overall, when people come to pay for something, it’s kind of that respect, give and take, right, which I think is fair for everything. Some people just can’t do it, and I’m like, ‘Don’t worry about it,’ because you’re still a fan, it still means something to you, so let’s try to take care of you. It’s all you can do. I think it’s great that you guys do make these appearances, because it is really special for fans like me. We’ve all watched these films and to be able to meet you guys and see that you are cool and down to Earth, and that you have pride in the work and in the legacy that you’re all a part of. The first thing with any show like this is you want to do the job well. You want to do right. It’s all about that. It’s not about, ‘Hey, look, I’m going to be famous for this,’ or, ‘Everyone’s going think these wonderful things about me.’ It’s not even in your mind, not even remotely. You’re busy with what you’re doing that day, and you’re trying to do your part to tell the story well. Then it’s out of your hands. There are so many more levels that go to it that you don’t have any control over. H20 is definitely one of the most popular of the films in the franchise, and I think a lot of it is because of what you said earlier, that it was an entry point to the series for a lot of people. It’s literally the next generation. My son’s teacher right now said the first horror movie he ever saw was H20. So it introduced him to horror, not just Halloween. And it wrapped up what Jamie was considering as a trilogy. It makes a great trilogy with the original and II. And I love that ending. It has finality, it’s done. That’s what she wanted. Can you talk a little about the different masks that were used in H20? Here’s the long and short of it. Two weeks before principal photography, they lined up versions of all of the masks from before, and photographed them from different angles and different lighting, and I tried different things on, so they could make a decision on what the mask was going to be. They decided on the first one. Then we started shooting. Every day when you’re done, you send the film off to be developed and then the next day or two you’re watching dailies. So they’ve had five weeks to see film with me on it. You’d think it wouldn’t take five weeks to say something’s not right. My feeling with the mask is that it was washed out too much. I don’t know this, but it seemed to be kind of the gist of why they weren’t happy with it. It didn’t have enough texture to it, maybe, needed to be a little darker. So five weeks in, on a Friday, we’re finding out that they want to re-shoot the mask and now there’s a big fight. So we shoot the scene with the original mask and then we shot it with another one, which was in 5 or 6. We shot it twice. It was a fairly dark scene, and we shot it with both masks to cover ourselves. By Monday, there was a new mask. And we’re re-shooting things like flipping the tables. So the hard thing with that is when you finish a scene and you’ve got it, you kind of put it in your back pocket and you walk away. You’ve done it, checked off the list, and you’re happy. Generally there are little happy accidents that happen when you’re filming, that you can’t recreate. So you’re thrilled that the scene has worked, and now you have to go back and do them. You’ve got to get the energy up. So we went back and shot a couple of key scenes. To me, it wasn’t that big of a deal in terms of getting the energy back up, because that’s something you’ve got to do in stunts. I’ve done things where you run in and you’re in a fight sequence and you get smashed through stuff, and you try to do it once and walk away. And you do it, and you sell it hard. And then they go, ‘We have to do it again.’ Then you get gun-shy, because you know what’s coming, and it’s going to be a big thump. But you can’t hold back, because you’ve still got to get the shot, so you almost go harder the second time. So my attitude going back is, ‘Let’s kill it.’ The crew is a little deflated, because they don’t want to have to reset stuff and do it again, but they’re professionals, so you just do it. So in the movie you’ve got long shots of the original mask, because it didn’t really matter, and then we reshot all the tight stuff and all the coverage. Then there’s the one scene where everybody says it looks like a CGI mask. It’s not a CGI mask. I think that was the original mask that they were trying to dirty up to make it look like the (Stan) Winston mask we ended up with, and they did a little bit of an alteration in CGI to it. And that’s what everybody calls the CGI mask. It’s not really CGI. It’s kind of CG-enhanced, but they didn’t really do it well, and that was the problem. It was kind of a quick shot and it was kind of a quick cover. It was a little sloppy. Is it true that you met with the producers of the new film (Halloween 2018)? The word on the street, if you will, changed constantly. ‘You’re too old,’ or it was, ‘No, we want an older guy. You’re too young.’ It literally swung back and forth, this information. (I threw my) hat in the ring, and they considered it. And you’re not privy to those conversations, obviously. And of course, to me, to get Nick (Castle) back involved in something is no brainer. As long as he can do it, that’s what I would do, because it brings it full circle with that group of people. When you think about the big picture and you’ve got Jamie (Lee Curtis) again and certain people involved behind the scenes, as long as Nick can do it, wouldn’t you hire him? So it’s nothing to get offended about on my side. It’s a no brainer. I’d go straight to Nick if I were the producer, because right there you’ve got a good catch to get everybody back in the theater. And everyone’s got their favorites, and that just is what it is. After they announced Jamie was coming back for Halloween 2018, there was an online petition of fans that wanted you back as Michael Myers. How did that make you feel? Fabulous, of course, because you’ve got support out there. What influence it had on the people making the decision, I don’t know that it did at all, but it’s a really nice nod from everybody.